In anticipation of the release of the live action Wonder Woman we're going back to 2009 and talking about the Wonder Woman animated movie. We're joined by special guest Jason Deline (Actor, Voice Director) and we discuss all the important things, how badass Wonder Woman is, the perfect story telling that is this movie, the amazing action, can Ares be trusted, and where did the invisible jet come from? 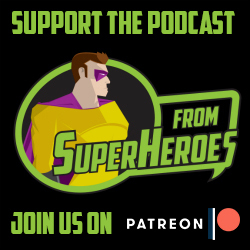 If you're looking for a new podcast to add to your listening then check out I Hate It But I Love It, a new podcast produced by the From Superheroes network. Hosted by hateful optimists and loving pessimists Kat Angus and Jocelyn Geddie, they break down movies, TV shows, music, and whatever else that they totally despise… but also really adore at the same time. With the occasional confused special guest!